This year, Jay Devi joined a women farmers’ group organized in her village by Oxfam India, through the “Prosperity through Resilient Livelihood” project funded by Buddhist Global Relief. A training in organic farming methods introduced her to vermiculture, and she began to make her own organic fertilizer using earthworm composting. In her first year of replacing the chemical fertilizers on her corn and bean fields with this organic manure, her harvest nearly doubled. “With the increased income, now I have started saving the surplus in my bank account,” she said. “With the savings we have installed a hand pump in our house. 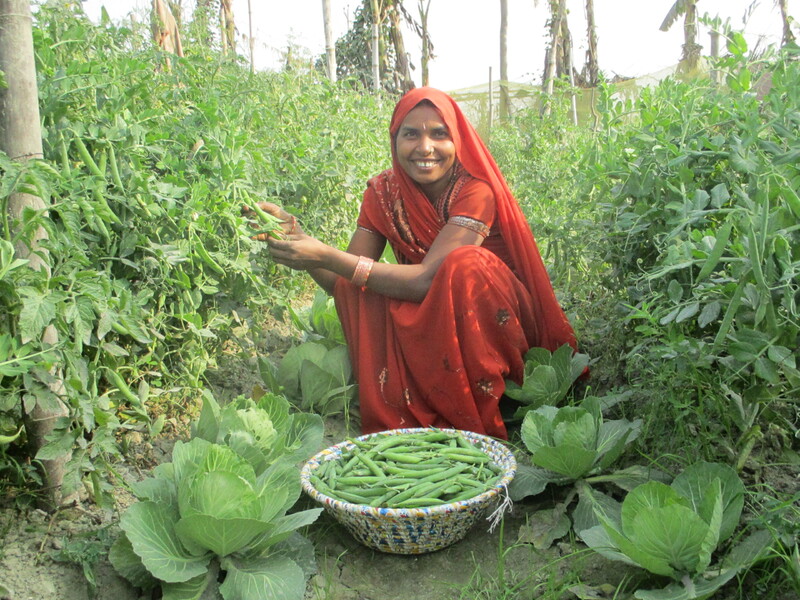 Now I do not have to walk 200 meters away to fetch drinking water.” She has begun using solely organic methods on all of her crops and continues to see her crop yields improve. 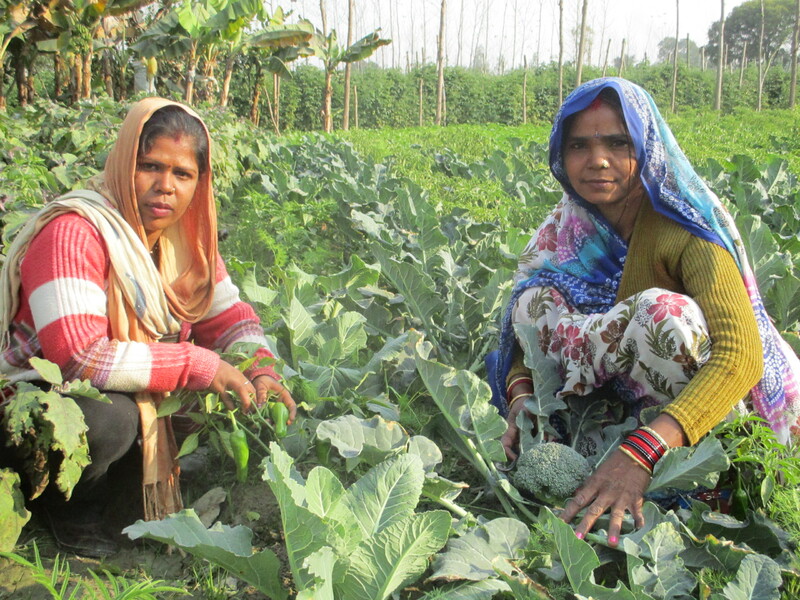 The Prosperity through Resilient Livelihood project established a women farmers’ collective and forty women farmers’ groups in the Lakhimpur Kheri district of Uttar Pradesh. These groups serve as spaces for women to share knowledge and support. The grant provided guidance and trainings in agricultural methods, community building, and financial management to nearly 800 women farmers through these groups, with an emphasis on climate-resilient agriculture practices—ecologically sound methods that have been found to increase crop yields and improve crops’ resilience to the effects of climate change, such as increased or decreased rainfall, periods of extreme heat or cold, and increasingly volatile weather. Women farmers learned about techniques including the System of Rice Intensification (SRI), mulching, rotational cultivation, rainwater harvesting, and the preparation and use of organic fertilizers, pesticides, and fungicides. The grant also supported the groups in obtaining government aid including assistance for seed banking, farmers’ field schools, and agricultural equipment and supplies. For many women farmers involved in this project, the transition to climate-resilient agriculture practices has enabled them to achieve a new level of economic independence and security. More than 300 women farmers reported income increases after switching to sustainable methods, and many of these women have opened savings accounts for the first time in their lives. Rajeshwari, a 38-year-old farmer and mother of four in Musadei village, also was caught in the precarious cycle of dependence on chemical fertilizers and pesticides. Recently she too had to choose between purchasing these chemicals and meeting the needs of her family when she found herself unable to afford tuition for her daughter, an eleventh-grader. Her daughter left school and joined the family in supporting the household. In October, the family’s tomato field was infected by a mosaic virus that destroyed the entire crop. This entry was posted in Agriculture, Buddhist social ethics, Food security, Projects & programs and tagged Food hardship, India, Oxfam, sustainable agriculture. Bookmark the permalink.